Sun Zoom Spark - "Electricity"
Recorded in 1999, only about 30 copies of Electricity were pressed, the album not getting a proper release until this year. The year after the album was recorded Sun Zoom Spark got sidetracked when guitarist Eric Johnson and drummer Bryan "Otto Terrorist" Kohl joined Jesus Acedo in the latest incarnation of the great Black Sun Ensemble (see new album review this issue). So though only now released, this album precedes the In Stereo CD I reviewed in AI #20. The album opens with the title track, a short thudding and totally stoned metallic intro bit. The band then launch into "What About You", a killer powerhouse psych-rock song straight out of the garage. The promo sheet refers to "Pink Fairies/MC5 styled acid rock" and indeed Pink Fairies comes to mind. I was head banging to the band's brain pounding but tightly executed thrash with its tripped out instrumental excursions and freaky alien synth embellishments. Wow! 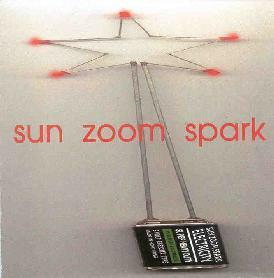 But similar to the In Stereo album, Sun Zoom Spark are full of variety. "Inna Di Poemhall" is a jazzy, Bluesy, metallic jamming rocker with a Stray Cat Strut groove. I love the way the band alternates between a lazy, soulful vibe and blistering power garage rock on "Falling From Satellites". "Loaded" is a power-pop tune with a 60's feel. "Secret Spark" features a killer blend of heavy driving metal and psychedelic power-pop. There's more 60's stylings to be heard on the fuzz rocking "Get To You". "Too Much" remind me a bit of Foghat, a reference I also made in my In Stereo review. And we're also treated to a cover of Syd Barrett's "Here I Go". Aside from "What About You", among my favorite tracks were the album's two instrumentals, "Seventh Space Dream This Week" and "Namnea Habebeh Nam". The former is a gorgeous slab of spaced out, Eastern tinged psychedelia, but with healthy doses of Sun Zoom Spark's trademark molten power rock. Love those trippy meandering organ lines. And "Namnea Habebeh Nam" includes beautiful liquid shimmering guitars and an underlying Stoner trance vibe. Finally, "Last Blues" clocks in at almost 13 minutes, though the promo sheet warns that there's a hidden track buried here. The band initially take off into an excellent stoned psychedelic power Blues jam. Then after about 5 minutes the music does a complete 360 degree turn, with a sample from the end of Sgt Pepper's "A Day In The Life", and then a monolog in Spanish. A moment of silence... a freaked out sample... and then a very cool power rock deep-in-space jam that brings the album to its conclusion. In summary, there is some absolutely fantastic powerhouse psych-rock on this album and there's no question that the participation of these guys in Black Sun Ensemble is to be credited with this being the best edition of BSE yet. Highly recommended. CLICK HERE to read the review of the new Black Sun Ensemble CD, also in this issue.